Experimental spacecraft will fling a net and shoot a spear at targets in space. 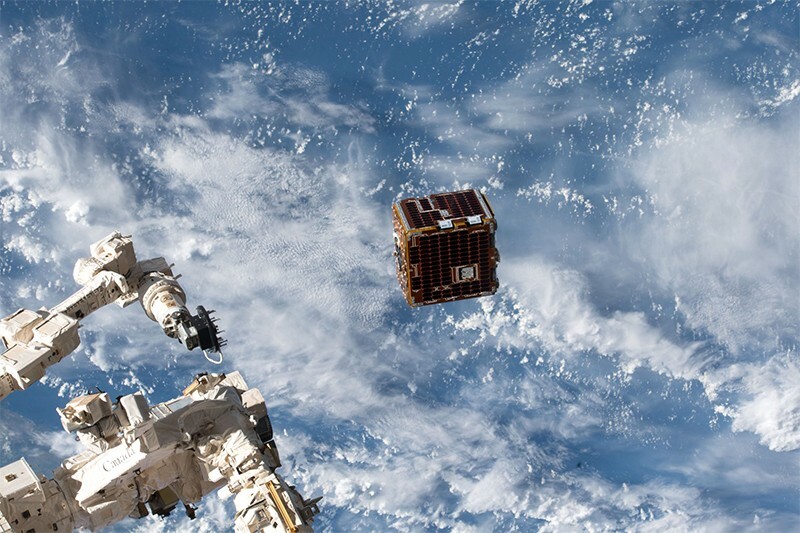 This weekend, in a move Spiderman might envy, one satellite will fling a net at another craft in low Earth orbit. A few months later, the satellite will ape the spear-wielding Aquaman and fire a harpoon into space. The manoeuvres will test ideas meant to address the growing problem of space junk. If they work, future missions might use similar nets or harpoons to ensnare dangerous space debris and drag it to a fiery end in Earth’s atmosphere. The US military tracks approximately 20,000 objects in orbit that measure at least 5 to 10 centimetres across. That’s big enough to cause serious damage if two objects collide, and the threat is growing as more junk builds up in space. In 2009, a US communications satellite accidentally smashed into a Russian one — creating thousands of shards that now hurtle through low Earth orbit, threatening future collisions. Now researchers are dreaming up ways to clean up some of this orbital junk. Last year, the Japan Aerospace Exploration Agency tried to unfurl an electrodynamic tether and hook on to a piece of space debris; it failed when the tether did not release as expected. A team spun out of the Swiss Federal Institute of Technology in Lausanne (EPFL) is raising money to build a satellite that would throw a conical net around a defunct craft and steer it to its doom. And the European Space Agency (ESA) is working on ideas for a more complex spacecraft that could dispose of space junk or perhaps even re-fuel a satellite in orbit, extending its life, says Luisa Innocenti, head of ESA's Clean Space initiative in Paris. The €15-million (US$17-million) RemoveDEBRIS mission is meant to test cheap ways to drag junk out of orbit. “There will always be a tension between letting debris stay as it is or going to clean up some of it,” says Aglietti. But if a space agency could remove particularly big and dangerous pieces of debris — such as ESA’s defunct, bus-sized Envisat Earth-observing satellite — it might be worth the effort. RemoveDEBRIS will test four technologies over a carefully choreographed few months. The spacecraft launched to the International Space Station in April and deployed into space in June. Now scientists are preparing for its first test, the net experiment, which is expected to happen on 16 or 17 September (see 'Ready, aim ... fire!'). If all goes as planned, the craft will eject a CubeSat, about the size of a loaf of bread, which will inflate a balloon to a diameter of roughly 1 metre — big enough to be worth grappling with. RemoveDEBRIS will then hurl its net around the balloon, using weights to cinch the net closed like a purse. The second experiment is planned for late October. RemoveDEBRIS will eject a second CubeSat, then scan it using lasers to test techniques for studying and navigating near space junk. The third test, throwing the harpoon, could come in early February. The RemoveDEBRIS satellite will extend an arm 1.5 metres into space, flip up a target plate and shoot the spear at it. Finally, in March, the satellite will inflate a 1-metre-long mast and unfurl a sail. The sail is meant to function as a drag, steering the satellite to lower altitudes so it will eventually burn up in the atmosphere. An industry consortium built the project, with subsidiaries of the aerospace company Airbus providing the net and the harpoon. The team has tested each experiment on the ground, but things could go awry in the notoriously difficult environment of space. “We are very much prepared for some of the things to go a bit differently than planned,” says Aglietti. But if it works, the space net and harpoon could become common weapons for dealing with space junk.